The information on the surveillance cameras in The Netherlands is very limited. The Dutch privacy activists address the non-existence of a surveillance camera register by various means. The crowdsourced project called CameraLocaties put around 3700 cameras on the map of The Netherlands. The dataset includes both public, as private cameras. The top 10 dedicated users are responsible for about 60% of the observations. Recently, Sargasso published a similar map at reportacam. This data was, however, collected from the municipalities and other public institutions via the freedom of information law and subsequently digitized. Here, more than 4700 cameras are noted, of which more than half are traffic cameras. Also, the provided information is often not complete. The only information provided more or less consistently by the institutions are the municipality, the coordinates of the location and the owner of the camera. There is little information about the camera types, and close to no information provided about the costs. To compare the cameras that have been put on the map using the two approaches, below are two maps of the notorious Red Light District in Amsterdam. 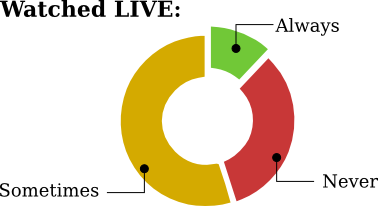 While the crowdsourced data seem to work more effectively if there is a dedicated user, reportacam delivers a more balanced overall coverage of the country. 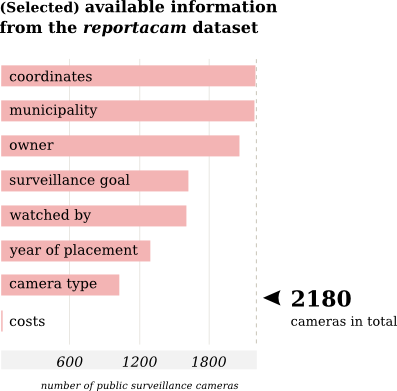 According to a 2009 government research about the state of art of the surveillance systems in the Dutch municipalities, about 25% of the nearly 450 municipalities had a public surveillance system. Yet two years later, it increased to 28% and 60 new surveillance projects started throughout the years 2011 and 2012. The average total costs of one project is more than 300 000 euros. These include, for example, building the necessary network and infrastructure, adjusting the street lights or creating monitoring centers. Further maintenance requires about 70 000 euros per year. The existence of a camera is never a solution by itself. Sometimes it is even not the most adequate solution to a given problem. There are several types of crimes that can be either prevented or solved with the help of a surveillance camera, but by far not all of them. The 2012 report on camera surveillance written by "Politie en wetenschap"  (police and science) distinguishes between several types of offenders and evaluates the efficiency of CCTV usage on the different types of crimes. The prevention factor of surveillance is very weak. Impulsive offenders, often under the influence of alcohol or drugs, are mostly either not aware of the surveillance, or they do not care about it. They are often responsible for minor offences, disturbance of public order and violence. A more effective way of prevention for these cases is a physically present police patrol. The more calculated offenders, on the other hand, are aware of the technology and learn how to circumvent it in time - but, if the possible gain is small, they do not take the risks. These are mostly experienced criminals who are involved in drug handling or thefts. The most effective purpose the cameras can serve is to direct police action to the places where it's needed at a certain moment. However, even then, the cameras have to be monitored in order to have an impact at all. The public surveillance cameras monitoring is executed by the provinces, municipalities and the police. It is most effective when being watched live. This assures a prompt reaction of the authorities. Due to reducing costs by staff shortages this is however not always possible. In the 2009 research, the municipalities indicated that only about one tenth of the cameras are being watched live all the time. One third is never watched live at all. Moreover, most of the cameras are active only during designated times during a day, sometimes not even on each day of the week. Still, the number of locations where the footage is monitored is constantly decreasing. So it can happen, that the whole province is being watched from one monitoring site. Up to date, there are 22 of these sites throughout the country. This can not only have an impact on the response rates, but also on the efficiency of the communication between the monitoring centre staff and the police. While one person can be efficient in looking at ten or maybe even a hundred cameras, with thousands of cameras the job gets tougher. There has, therefore, been a demand for automatisation of the process of detecting suspicious behavior. “Intelligent surveillance” can take the form of face detection, behavior and emotion detection, or left luggage detection on the airports. The system is, subsequently, able to let the human agent know that something unusual is taking place. Some municipalities execute reports on the efficiency of the surveillance cameras in the region. One example of these is a 2012 report from Amersfoort. In the 2 years period, 1100 incidents were reported from the monitoring center in Utrecht to the police in Amersfoort. Out of these, 400 could be dealt with either by appearing on the spot (250) or by identification of the suspect from the footage. The report concluded that the cameras added up to the safety and even placement of more cameras at the spots where most of the incidents occred was being considered. Also - with opposition from the police - the need for cameras that did not seem to have an added value was being reevaluated. On top of the local reports, an independent institution called Regioplan regularly carries out evaluations of the camera surveillance in the assignment of Dutch The Ministry of Home Affairs. The last report, dated 2011, stated that the quality of the local reports is often very bad. Generally, the biggest problem seems to be the initial question of the research. "Evaluations of the camera surveillance should [ask themselves], whether camera surveillance is the best way to solve the particular issues in a particular region in the first place." "However,", the report adds, "we have to note, that the efficiency of a camera surveillance is though to determine and sometimes impossible to measure." Assessing the direct impact of the surveillance cameras on the crime rates is obviously difficult. Because of the lack of a general overview on the amount of cameras in the country, only incomplete data on the public camera surveillance are available. Moreover, it also seems that the surveillance in The Netherlands is often deployed in a rather costly and inefficient manner. While this is probably not only the case of The Netherlands, to see that there is a constant effort in evaluating the usage of surveillance cameras from the authorities, as well as vital citizen activism in this domain creates a positive outlook for the future.